The award-winning eClinicalWorks Electronic Health Record (EHR) system is more than just a way for your practice to go paperless. Unified with the eClinicalWorks Practice Management system, patient flow from check-in to departure is streamlined. Workflow from the front desk to physicians to billing office staff is seamless. Documentation is faster using templates, drop-down lists, and more. eClinicalWorks 11 and 11e are now compatible with Mac and they work with the eCW dental module. Version 11 (exe) requires the Scriptel plugin which is available from the eCW portal (see below). 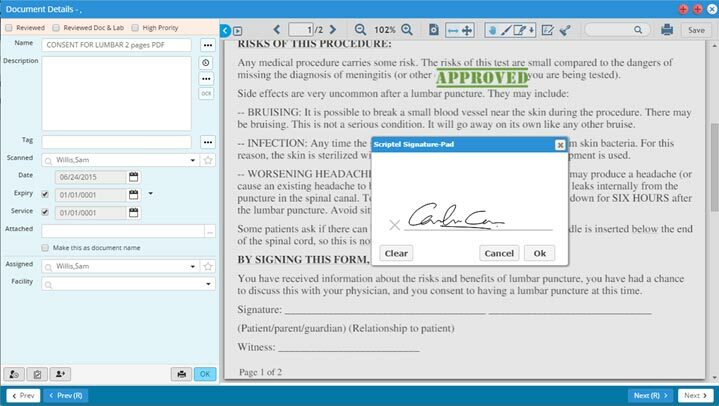 Scriptel EasyScript interface pads are now fully integrated with eClinicalWorks Electronic Health Record (EHR) for signature capturing in versions: V10 (exe) 10e (browser) and V11 (exe) 11e (browser). See the example below. No plugin is required for eCW’s Browser mode (10e or 11e). However, for the exe version, a plugin is required, which can be obtained by logging into eCW 10e or 11e and downloading it from windows->settings.